As the fog of slumber lifts and the reality of wakefulness settles upon me, it is there. A heavy stone—which may as well be a boulder—is pressing against my chest. The full weight of it constricting my breathing and creating a pain that radiates out into my limbs and up into my neck and head. Putting my hand to my forehead I think: Not today. Please let’s not do this today. Yes, it is Monday, but that isn’t reason enough for this. Quickly I run down the bullet points of the day that lay in front of me and of the events of the week and evening prior… looking for any sign of trouble that might be to blame. But there is nothing there. As I toss aside the blankets and set my feet upon the cold, hardwood floor my breathing quickens and my heart races. The bedspread doesn’t look quite right. The notion of making my bed like I do every morning without thought or consideration suddenly overwhelms me. I feel nauseated. Everything around me unfamiliar yet familiar at the same time, like walking down a hallway of funhouse mirrors. 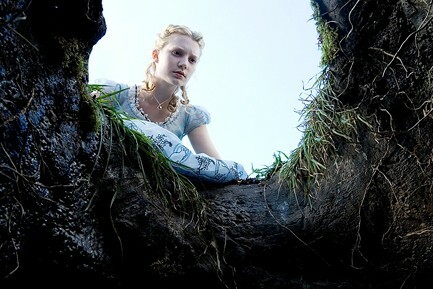 Looks like I have fallen into the hole again and I have no choice but to climb back out. For those of you fortunate enough to be unaware of what I am describing… allow me to introduce you to the adventure that is a panic attack. To help you gain a more accurate perspective, imagine Alice in Wonderland plus a sense of impending doom but minus the tea parties, talking critters and croquet—in other words—all of the disjointed creepiness and none of the fun. As much as I want to fight it, I suppose this is one of those rare but “as needed” mornings that the prescription bottle clearly addresses. Like Alice in the rabbit’s hole, I follow the instructions of the container on the table. Hesitant and grateful all at once for the way this will transform me, I swallow the contents and grasp for my footing. As your mother who probably geneticly passed these occurances on to you due to a flawed nervous system, I know exactly of what you are describing. These attacks are very much a distortion of reality and a scary thing. Thank God for medicine that helps the situation. At least we can identify it for what it is and do something about it. My heart goes out to the people of past generations who experienced this and had no label or meds for it. Or for those who would not dare to talk about it or admit it or anything else wrong with them. I didn’t realize until recently that if you had epilepsy you could be labled a mental patient and possibly put in a crazy ward even up until maybe the 40’s or 50’s! I love that your mom said what she did. I really really do. Praing for a clear mind and a renewed sense of purpose for you today! Thanks much, JT. Unfortunately… today was NOT the day for a renewed sense of purpose of clearer mind. But it will come. I appreciate your encouragement.